Elsa-Grace V. Giardina, MD,MS is Professor of Medicine at the Columbia University Medical Center and Attending Physician at the New York Presbyterian Hospital. She trained as a non-invasive cardiologist, pharmaco-electrophysiologist and clinical pharmacologist all at Columbia University and recieved a Master's degree in metabolism from the Institute of Human Nutrition, College of Physicians & Surgeons. Her current research and educational focus is on cardiovascular risk and the impact of nutrition and obesity on intergenerational cardiovascular health and disease among women and their families. Dr. Giardina is recognized nationally as an expert on cardio-active drugs and has been a member of the Cardio-Renal Advisory Committee of the Food and Drug Administration (FDA) and the Pharmacology study section of the National Heart Lung and Blood Institute (NHLBI). 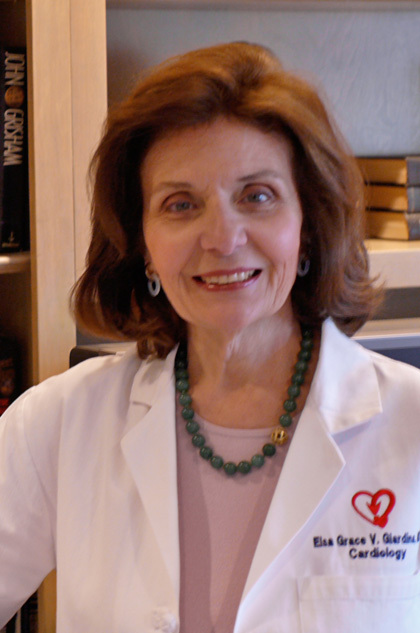 Her many honors include the Jane V. Myers Memorial Medical Scholarship from Bryn Mawr College, the PMA Faculty Development Award in Clinical Pharmacology, the American Heart Association Appreciation Award for community service, the American Medical Women’s Association Gender Equity Award and she is a Trustee of the New York Academy of Medicine. She is a Fellow of the American College of Cardiology (FACC), the American College of Physicians (FACP), and the American Heart Association (FAHA). She was awarded the “Award of Excellence” by Governor George Pataki of New York State for research advancements on cardiac disease in women and for developing the Center for Women’s Health at the Columbia University Medical Center. She received the Medal of Honor from New York Medical College for outstanding achievements and was named a Fellow of the Virginia Apgar Society, an honor bestowed on Columbia University faculty that recognizes individual achievement and commitment to education excellence. Dr. Giardina has mentored more than 40 students, residents, fellows and young attendings in the specialty of cardiovascular disease, women's health and nutrition. Heart Health in Action: Dr. Giardina has been investigating the health of minority women since 1992. She and colleagues designed Heart Health in Action, a community-based team concept with original funding from the Office of Women’s Health, U.S. Department of Health and Human Services. The program, focuses on risk reduction for heart disease and stroke, identifies patients with components of the metabolic syndrome (hypertension; low HDL-cholesterol; high triglycerides; high blood sugar and increased waist size). The project has screening, education and awareness, behavior modification, and tracking and evaluation components. The data base consists of more than 1100 subjects and 40 medical residents, cardiology fellows, graduate students, and young faculty have contributed to more than 75 publications and presentations in high quality, peer-reviewed journals. For information or to volunteer, call: Dr. Elsa Giardina at (212) 305-5371. Giardina EGV, Sciacca RR, Foody JAM, D’Onofrio G, Villablanca A, Leatherwood S, Taylor A, Haynes SG. The Office of Women’s Health initiative to improve women’s heart health: focus on knowledge and awareness among women with cardiometabolic risk factors. J Women’s Health, 2011, 20:1-8. Paul TK, Sciacca RR, Bier ML, Rodriguez J, Song S, Giardina EGV. “Intergenerational Misperception of Size among Overweight and Obese Families.” J Gen Intern Med. 2015 Jan;30(1):43-50 101.